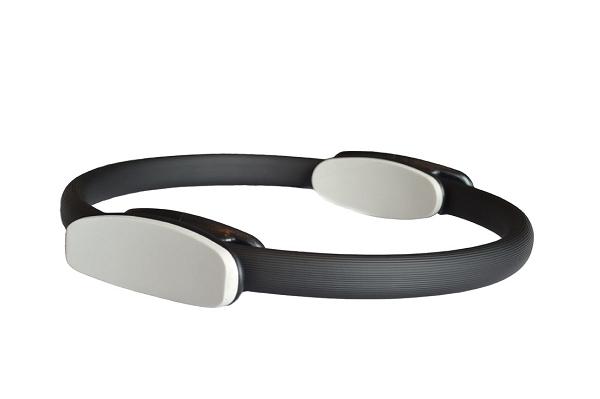 Tone arms, legs, glutes and abs with this versatile Pilates Toning Ring. The grips on this Pilates Ring are foam-cushioned, allowing you to comfortably grip and hold the ring in place as you move. Portable with no sharp edges, and measures 14.4" diameter. Pilates Toning Rings are used in many Pilates exercises that work to firm and tone arm, leg, buttocks, abdominal, and back muscles. The unique grips on this particular Pilates Ring are cushioned, allowing you to comfortably grip and hold the ring in place as you move. Also unlike other Pilates Rings the actual ring is covered in soft material and has no sharp or hard surfaces. Ordered these to use in my classes, they are great! Sturdy, yet comfortable. There are so many options for use with these! I would purchase again. Recently purchased and using regularly. Sufficient resistance for my purposes. Good quality, price and good customer service. These rings are of good quality and a fair price. Thanks for the super fast shipment too! Bought 10 of these for Pilates training and mat classes. Really happy with the rings. Class members are very pleased that the entire ring has a slightly padded, textured cover. Having padded grips on both the inside and outside allows comfortable use in many positions. They feel strong enough to withstand a great deal of pressure. The price is excellent. I'm counting on them to last for years.